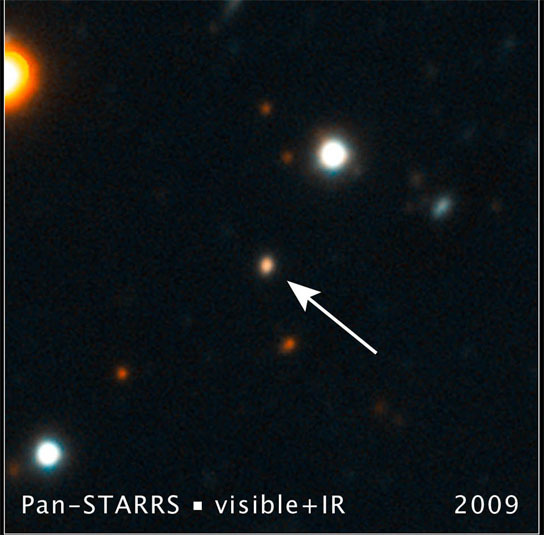 A team of CfA astronomers is reporting that the object they observed using the Pan-STARRS telescope was a supermassive black hole, roughly two million solar masses in size, devouring what was probably a 5 billion year old star. Black holes can come in a wide range of masses. Some, with only about one solar mass, result from the supernova death of a massive star, while those at the center of galaxies (called supermassive black holes) have millions or even billions of solar masses. Supermassive black holes are relatively famous because they are responsible for the powerful jets and other dramatic phenomena seen in some galaxies. The center of our Milky Way galaxy contains a modest-sized supermassive black hole, with about four million solar masses, and (fortunately for us) it is inactive – it lacks the extreme phenomena seen elsewhere. Black holes are so dense that nothing, not even light, can escape from their gravitational clutches. Still, black holes can be detected because matter that falls into them heats up, and emits bright radiation. A short-lived flare, for example, can result when a body (perhaps a cloud of gas or a star) wanders too close to a black hole and is eaten. Astronomers are particularly interested in measuring the way the brightness of the flare increases, versus its decline, because the shape of the rising emission holds clues to the actual infall process. Observing such events is difficult, though, because the flaring activity may only last for a few months — by the time it is spotted in the sky the most diagnostic phases of flare activity may have passed. Moreover, flares from smaller supermassive black holes (like the one in the center of the Milly Way) may be correspondingly weaker. Pan-STARRS (Panoramic Survey Telescope & Rapid Response System) is a telescope with a small mirror (1.8 meters) but a very large field of view, and large digital cameras (1.4 billion pixels) developed especially to look for transient events. It can observe the entire available sky several times a month. In May of 2010 it spotted what appeared to be a flare from a previously inactive, Milky-Way-sized supermassive black hole in a galaxy about two billion light-years away. A team including CfA astronomers Ryan Chornock, Edo Berger, Peter Challis, Gautham Narayan, Ryan Foley, George Marion, Laura Chomiuk, Alicia Soderberg, Bob Kirshner, and Chris Stubbs, then led an aggressive follow-up campaign of observations to see what was going on. The team reports on their discovery in this week’s Nature. They began observing the flare about 40 days after it went off and about 40 days before it peaked, providing excellent data over most of the event. Detailed modeling of the light led the team to conclude that the black hole is less massive than previously thought, only about two million solar masses, and that the object it devoured was probably an evolved star (about 5 billion years old) whose mass was about 0.2 solar masses. These new results provide a particularly impressive, detailed view of what goes on in these exotic cosmic flares, and offer support for the overall model of these flaring events. 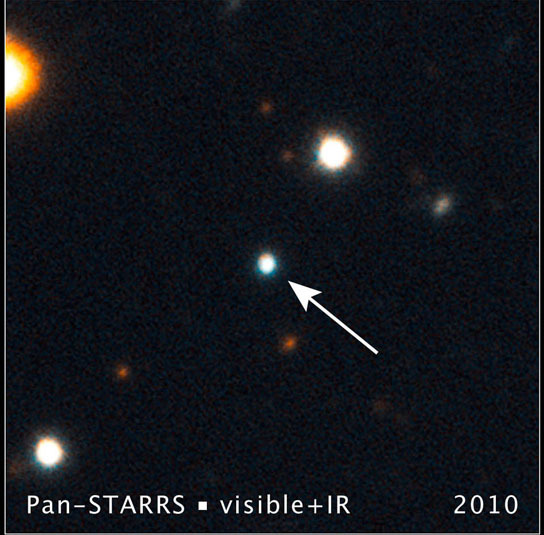 Be the first to comment on "Astronomers Observed Evolved Star Being Devoured"